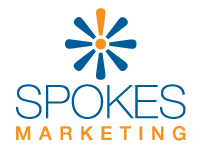 Spokes Marketing is a different kind of Ad Agency, focused on helping small and medium-sized businesses get more from their marketing: GENERATING LEADS, CONVERTING LEADS TO CUSTOMERS and GETTING CUSTOMERS TO RETURN more often. Since 2006, we have focused our energies working with a select group of industries and have developed many successful marketing strategies and campaigns for our clients. Our belief is that by specializing in a few core industries, our ability to make an impact for our clients increases dramatically through an in-depth understanding of our clients’ goals, core metrics, and our ability to develop and strengthen our proven strategies. Over the years, we have developed winning strategies and campaigns for our clients. The fact that they are still with us after all these years is a true testament to our ability to deliver results. Spokes has repeatedly and consistently developed an excellent design product that has effectively showcased our services. Each team has provided professional results based on planning meetings and feedback proposed concept and product output. You have done a beautiful job on the website. Really! The photos are gorgeous, the layout is thoughtful, and the content is useful. Your hard work is very much appreciated.